Mapping the oikoumene by Marinus the Tyrian and Claudius Ptolemy (Cp1 to 5 and Mt1, Mt2) had not been bettered by c1300 in Britannia. In 1154 Al-Idrisi produced a planisphere and geographical text which had there-in 70 small maps subdividing the oikoumene in a regular pattern. 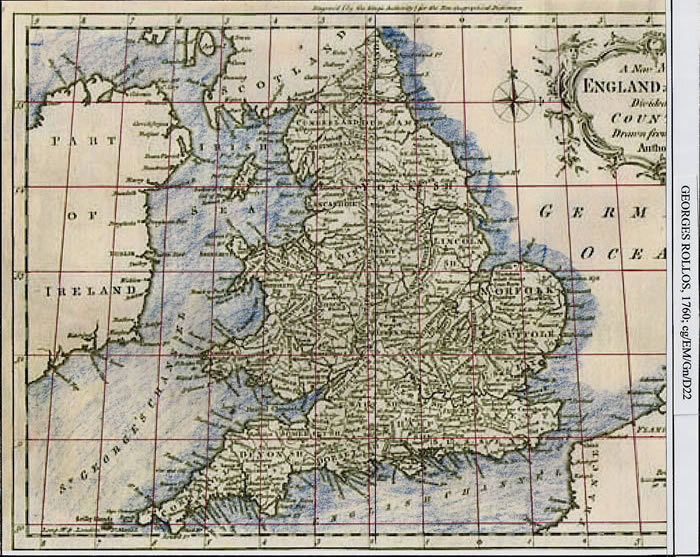 But his map of L’Angleterre (cgId1) was based upon an upturned Ostrich Head and included only the south and east coasts from Lands End to Tynemouth sans Wales. 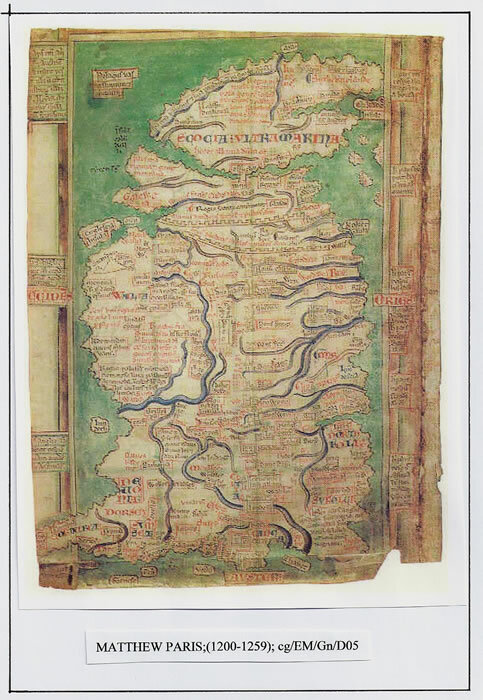 Thus the map by Claudius Ptolemy drawn c150CE was the only map of the whole of Britannia possibly available to cartographers. Unfortunately we can only guess at what maps the Romans may have had and their accuracy, but from the survey markers we find in the landscape, which are quite accurately placed, there is no reason to doubt they may not have been very accurate. However, the Romans did not occupy or survey Scotland. Then, in the 12th and 13th centuries Clerics commenced map-making and gradually the form of Britannia, a recognisable geographic form evolved. But the problem of Longitude pervaded the maps and scale only gradually became a mathematical concept. The bordure scale was drawn without accuracy, and north was a moveable direction, perhaps because of the magnetic compass. With the change from manuscript maps to printed maps evolved another problem, that of the printing-press bed size and thus the map size unless it was constructed from several sheets. There is a definitive history of English Maps written by Catherine Delano-Smith and J P Kain entitled, “English Maps A History”. With such a text available it is non-sensical to rewrite the overview so cogently put in Chapter 2, “A Medieval Flowering”. Therefore the text has been sampled and a précis made as required. The extracts commence at page 40, with varying lengths of text. Naturally the first system would be that of Claudius Ptolemy as explained in his book, “Geographia”, but it was not thought to be available in Britain until a copy was given to the University of Oxford in February 1444. It was a Latin translation from the Greek text by Antonio Pacini. In an end note (98) CDS/JPK state, “The study of Greek in England is thought to have declined after the 7th century, that even had a Greek text arrived in the country before the 13th century, few would have been capable of reading it. In the 8th century, for instance, there were “books of Cosmography written in peculiar letters which no one could copy” and which might have indicated “a book of Byzantine Geography”. (J W Thompson, The Medieval Library, p113, Chicago 1939). That begs the question, “what was the text spoken of by the Venerable Bede in ‘Vita sanctorum abbatum monasterii”, para 15, where he writes that a particularly finely-executed ‘manuscript of the cosmographers’, (Cosmographiorum codici mirandi operis) was carried from Rome by Benedict Biscop”? Bede does not refer to it being a Latin or Greek text, although as it was exchanged for 8 hides of land we can surmise it was Latin and thus had some great value to clerics. In the 12th century, Ptolemy’s ‘Almagest’ was circulating in the west; it contains the basis of his cartographical ideas and plainly states that topographical maps should be drawn using tables of latitude and longitude. This book was translated from Greek to Arabic in 827 and then Latin in 1175. But, by the early 1150’s Arabic was studied at the Norman English court in Normandy. That intriguing fact introduces the work of Al-Idrisi who was at the court of King Roger II of Sicily. He, we are told, gathered a large corpus of Arabic text, including a copy of Ptolemy’s ‘Geographia’, as the list within “The Book of Roger” by Al-Idrisi explains. Texts cgId1 to cgId4 explain the ‘Book of Roger’ etc. The Sicilian court was enthused by Arabic learning being in what was once an Arab territory. Al-Idrisi came from Spain, Al Andolos, although he was born of a noble family in Cueta, North Africa. In Spain a treatise had been written concerning the Astrolabe, an instrument necessary for astronomical calculations, which may have been translated into Latin in England around 1147, probably by the Spanish Jew Abraham ben Ezra. Thus the text quoted from page 43, even with the coda of page 48, perhaps understates the possibilities, particularly the transference of geographical knowledge from Sicily to Normandy to England. It is without doubt a fact that there was transference of information in the opposite direction, England to Sicily. Al-Idrisi, writing in 1154, ‘The Book of Roger’ has a complete section on L’Angleterre in which he discusses the English coast from Lands End to Tynemouth with ‘harbours’ described, all of which are in fact the new Norman Castle sites around the coastline. Al-Idrisi likens this coast with the shape of an inverted Ostrich Head (south is north), and this is an apt description even though he has the southern coast turn to the north in the wrong position (text cgId1). 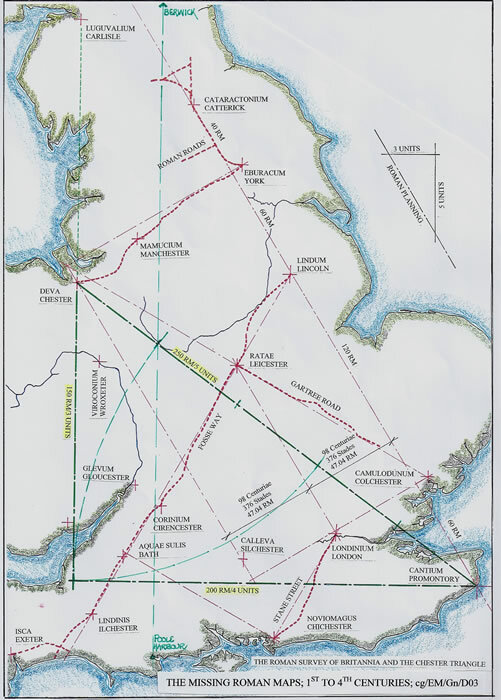 The original paper is to be found under reference Gm1 on the cartography page of this website. The Gough map was the subject of a colloquium held in Oxford, June 2011, with a Bodleian Library exhibition titled ‘The Language of Maps’ with various lectures given around Oxford. The colloquium sub-headed ‘The Gough map’ was actually entitled ‘Linguistic Geographies’ and over 3 days comprised 19 lectures, of which only two actually discussed the Gough map as their central theme. One concerned the linguistic and palaeographical context of the map, dating it to perhaps the 1370’s with an extensive revision in the first 30 years of the 15th century, and the second was a comparative study. Here follows abstracts of those two papers. “Linguistic geographies: Three centuries of language, script and cartography in the Gough map of Great Britain”, by Elizabeth Solopova, Oxford University. “The paper will present the results of a new linguistic and palaeographical study of the medieval Gough map of Great Britain. Scholars have previously believed that the map was largely (with some exceptions) a work of a single scribe. My recent investigation of the manuscript, as part of the AHRC-funded ‘Linguistic Geographies’ project, suggests that it was produced in the 1370’s but extensively revised in the first quarter or the first 30 years of the 15th century. The map reflects contemporary language, traditions of literacy and cartography, and geo-political outlooks of both its original creators and its 15th century users. In addition it almost certainly incorporates geographical knowledge and political aspirations which had already developed in the 13th century. This complex document fully partakes in the textual fluidity of late medieval manuscript culture, and can be understood only as an evolving image and text, incorporating layers of language and meaning across three centuries of medieval English history”. As already noted, preceding these texts I had written the paper, ”The Gough Map Investigated” and posted it on this website as reference Gm1. It examines how the map could have been constructed and drawn, but not in the minutiae of detail as other texts noted. Not one of those discussed how it could have been constructed. My conclusion was that it would have been drawn using a graticule, which if originally drawn with charcoal would have long since disappeared. The graticule need not have been a full grid but simply four lines to regulate the cardinal directions for the draftsman. I also considered that there would have been a scale, probably a single line with dots there-on for equal measures as there is constancy within the map for similar measures, and therefore to have to hand the scale would be a necessity. “The Gough map stands alone as a work of immense clarity. But it is an enigma requiring examination to comprehend the knowledge utilised. To draw a map, scale and the relative disposition of features must be known. But, apparently any such data normally appended to a map was removed when the vellum skins were cut to their rectangular shape. Previous investigations of the map fundamentals have indicated accuracy in its overall concept, but have not determined the basic parameters. 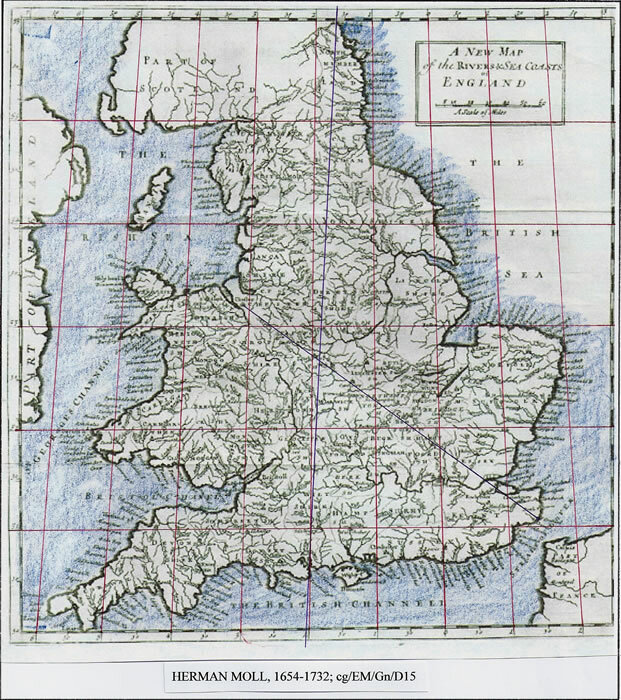 If such accuracy was achieved cAD1360, just how was the data collected; the survey carried out to determine the extent of Britannia; and, how did the cosmographer set the map form upon the vellum? These questions are answered and the putative graticule is marked on the map. This is made possible by the discovery of the Roman Mile and the Statute Inch in the form of the map. The basis of the whole map is shown to originate from a Roman Survey of the 1st and 2nd centuries. The graticule utilizes the Roman Latitudinal measure of 75 Roman Miles and is drawn to the Ptolemaic proportions of 11:20, thus indicating that the data concerning Claudius Ptolemy was available in Britannia prior to the AD1295 translation by the Greek Monk Planudes. “ The Gough Map1, generally referred to in glowing terms because of its apparent accuracy is believed to be the product of a cosmographer working in Britain cAD1360. It is also thought to be a redrafting of a compilation made cAD12802. The third set of features within the confines of the coastal form, are a series of red lines with Latin numbers appended. These have been variously thought of as roads with inter-distances, much as shown on the Tabula Peutingeriana, or, merely as the inter-town distances as described in the Itinerarium Antonini ( Rivet4, 1979), without inferring a road route (Margary51955). The editor commented that he thought the referee had only read the abstract and introduction! I was slightly bemused as to how the comments regarding a ‘scale-bar’ or ‘projections removed’ could be construed from the text, but it must be patently clear from the foregoing quotes, text and discussion points that this is precisely what has been discussed and inferred within “English Maps A History”, as well as other papers mentioned. The fact that it is possible to retro-fit a graticule, a Ptolemaic graticule, to the Gough map of c1370 (to 1430) indicates the distinct possibility that through the Norman Hierarchy, Sicily to Normandy to England more data arrived than we previously considered, precisely as the “CODA” intimates. With regard to the work by Brigitte Englisch, I comment as follows; firstly Catherine Delano-Smith is at pains to point out that when discussing medieval maps we must distinguish accurately between the various forms and state clearly which genre of maps we are discussing. B.E. is discussing medieval world maps, Mappaemundi, which are in fact nearly all circular in format. I quote; “in her study B.E. 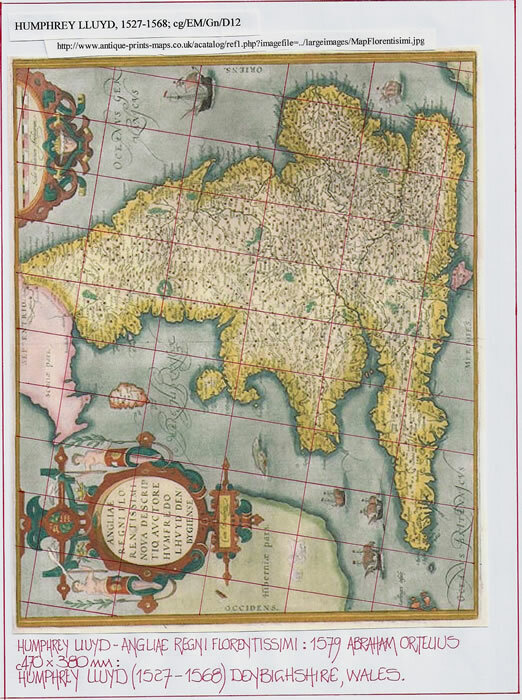 shows that the medieval world maps, the Mappaemundi, both from their concept and in their concrete practice are founded on a systematically geometric projection of the known world. The basis of this projection, however, is not geographical surveying but the harmonious order of God’s creation. Using regular geometric forms like circles and triangles which are also regarded as religiously perfect they created a coherent planisphere system”. Thus I do not consider the work of Brigitte Englisch to cover the singular map of Britannia that is the Gough map. It is not a planisphere, it is a map founded on a geographical survey, mathematics and geometric projection, and certainly not harmonies to God’s creation. It is the natural Britannia as seen by peoples of preceding ages. In his book “The Age of reconnaissance”, J H Parry writes, “Marco Polo, and the travellers generally, had very little influence upon the academic geographers and cosmographers of the later Middle ages; so wide was the gap between theory and knowledge”. He continues, “Just as the ‘Travels’ of Marco Polo and similar travel books had their cartographical counterparts in the Catalan Atlas and other maps in the ‘Portolano’ tradition, so the scholastic geographies had their counterpart in the great ‘mappae-mundi’, such as the Hereford and Ebstorf maps, with their central Jerusalem and their symmetrically disposed continents- all-embracing in scope, splendid in execution, and for practical purposes useless. Symmetry and orthodoxy rather than scientific verisimilitude were in general the guiding principles of these works”. Those words were written in 1964 and illustrate that if we are to discuss maps, geographical maps which have mathematics as their base, we should not confuse other forms of world diagram. My final comment is that the colloquium did not even attempt to consider how the Gough Map was actually drawn; the technicalities of a map purporting to be geographical; the placement of a large number of towns and villages within a coastline which is eminently recognisable; the rivers; roads with distances appended etc. Yes, those points were discussed but not in the context of the maps construction. Thus I consider the Gough Map an ongoing investigation, one which I am surprised has not been taken up by cartographic historians to solve the enigma of the map itself. If a map already has a bordure scale, naturally we would expect it, within reason, to reflect the actuality of a geographical graticule. That is, the longitudinal lines will reflect north/south and the latitudinal lines east/west. Many maps have bordure scales which are mere marks and not projected as lines across the face of the map. Draw those lines on some or even most maps c1300/1760 and errors varying from 5 to 10 degrees will be found. But the strangest error is that of a bordure scale indicating a tapering longitudinal graticule and the underlying map not being coincident with those lines. For this to happen co-ordinates are required. When Claudius Ptolemy set down his tables of co-ordinates, for each individual map he stated that provided the ratio of the graticule was correct for the centre of the map it would make little or no difference if the graticule was rectangular or tapering. What does make maps erroneous is if they are drawn with a rectangular graticule but a tapering graticule bordure scale is appended to indicate the cartographer was aware of geographic reality, but did not have the original co-ordinates of latitude or longitude to plot the map upon the tapering graticule. A single diagram cg/EM/Gn/D23 has three sections there-on for explanatory purposes. In the centre is a geographical map of Britain with tapering longitudes (and a slightly curved latitude plot). A form of map that was hard to emulate in earlier times, but suitable for this exemplar. To its left is a rectangular grid based upon the same latitudinal scale of 111.136Km per degree. At its central latitude of 54.5N the grid is therefore 64.54Km wide, which is converted to 129mm measurement for 8 degrees longitude. The diagram to the right of the map is a tapering grid based upon the cosine ratios of both 50N and 59N. At 50N, the 8 degree width is 140mm and at 59N it is 115mm; compare that to the 129mm of the rectangular map and the difference is quite marked. Place these graticules as overlays to each other and they will of course align at one point only along the 54.5N latitudinal centre line, with distortions above and below that 54.5N line. For simplicity of explanation, diagram cg/EM/Gn/D24 has been set out from 50N with rectangular and tapering grids superimposed on each other with a centre line of 2W. Various places are then located on the grids according to their co-ordinates, and the differences in position are easily observed. Thus the individual maps that are being studied can be analysed and their underlying graticule observed which in nearly all examples is not the bordure scale appended to the map edges. Here it is perhaps pertinent to mention a curiosity in the maps form; most of them are tilted eastwards as if moving magnetic north to geographical north. 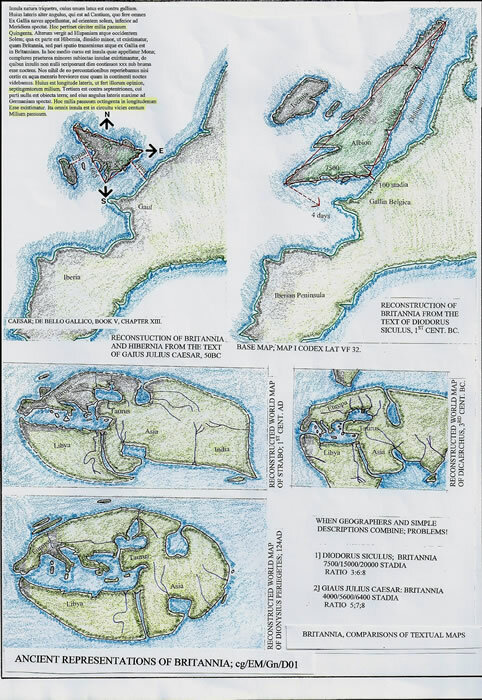 But, it is also possible the maps form has been twisted to raise the position of the Cornish Peninsula apropos the bordure and therefore allow a smaller copper sheet to be used for the actual engraving and thus less paper in the printing process. Thus the bordure lines would be at variance with the maps basic grid. It is worth re-iterating the basic methodology to locate geographical north upon a map without recourse to using the bordure if it appears at odds with the maps form. There is a natural triangle formed by two points, Cantium Promontory and Chester. These are Roman Survey points fully explained in BAR British Series 359; 2003, “The Roman Survey of Britain”. From Cantium Promontory to Chester it is precisely 250 Roman Miles, but the northing distance is precisely 150 Roman Miles and the easting distance precisely 200 Roman Miles. Thus there is in the landscape of Britain a 3:4:5 triangle whose sides are precisely north/south and east/west. Thus on any map if the distance is measured and marked between Cantium Promontory and Chester, and then subdivided into five parts, three of which are projected south from Chester and four of which are projected west from Cantium Promontory the basis of a graticule is formed and the distance northing is actually 2 degrees of latitude. That is because it measures 150 Roman Miles and 75 Roman Miles (each 68.934 Statute miles) is in fact the Roman World degree measure. When compared to the actual latitudinal degree which is 69.06 statute miles, the difference is not perceptible on these or many maps. This exercise, if the map has any accuracy at all, will indicate that if the north/south line is projected northwards from Chester it should pass directly through Carlisle/LUGUVALIUM, 129 Roman miles (190.8KM) north. It should also be possible to plot a longitude from Poole Harbour northwards to Berwick on Tweed, which is a geographical north line and the centre line for Britain (see O.S. maps).This will be precisely parallel to the triangles north/south line if the position of Berwick has not been altered. If diagram cg/EM/Gn/D25 is studied there are other alignments which could be used to check the veracity of a map and ascertain its accuracy. Thus we can plot on any map a graticule from the 150 Roman Mile or 2 degree distance measure and test it against known latitudinal positions such as 53N which is barely north of the N Norfolk coast and 55N which is the latitude across England from the Solway Firth to Tynemouth. 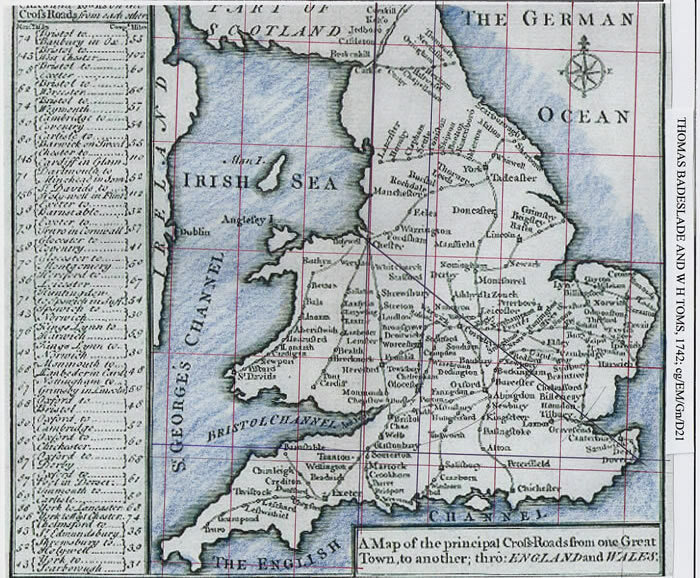 It is a curious fact that extant English maps show a visible seed change in the form used to portray England and Wales particularly from manuscript drawn to engraved map. That is not a geographical form per se, but a presentation format. The manuscript maps have an upright format; the engraved maps a definite eastwards tilt. There are only a few manuscript maps extant including, Gough, Angliae Figura and George lily. But when intaglio engraving on copper plates overtook the manuscript and woodcut system, then a plethora of maps, a veritable deluge arrived. But, where-as a manuscript map could be virtually as large as the author required by joining sheets of paper or animal skins together, copper plate printing suffered from the size of plate fitted into the printing bed available. That does not mean a map size was limited, just that it would require to be engraved upon numerous plates, printed and glued together; a very costly exercise, but one that occurred. The problem appears to be with the singular map, such as for England and Wales, and fitting it onto a copper sheet. Was the original always so sized to suit the printing bed, or did the engraver have latitude within his remit to resize the map to suit the copper available. Normally a map would be pricked through onto the copper and then a mirror used to give the engraver the reverse picture so that a positive was produced when printed. Thus the map was to be as small as practical to save on copper and paper. They do seem to have a median size around 450/500mm x 350/400mm, or perhaps easier for the time, 18/20 inches x 14/16 inches. 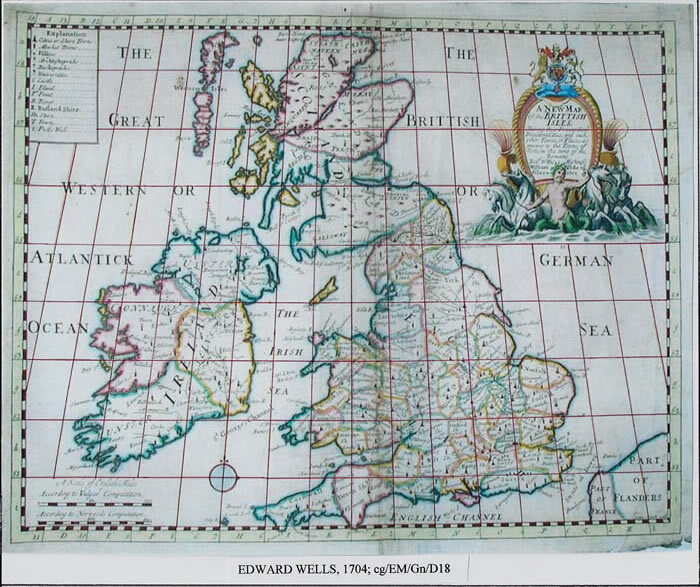 Did this therefore mean that the form of England and Wales, particularly the Lands End peninsula, was either twisted northwards or that the whole of the map was twisted eastwards to raise that peninsula and thus utilize a smaller copper sheet, or one which would fit the printing press. Thus, provided the bordure scale (if shown) was correctly marked the twist of the map would be quite acceptable, it would have mattered little, but that is not what happened. The engraved maps appear to be tilted by varying degrees to the east, mainly because they are of different sizes, but it can be shown that a considerable piece of copper could be saved. The map by Humphrey Lluyd (1527-1568) diagram cg/EM/Gn/D12, was engraved in Amsterdam by Abraham Ortelius in 1579. It is c470mm x 380mm and is printed on a slightly larger paper to give a frame to the bordure of the map. But the map has two geographical problems; firstly it is tilted 10 degrees to the east of geographical north, which is generally the bordure itself, and, secondly Lands End is over half a degree north of its natural latitude. This fact shows clearly when a geographical graticule is appended to the map which was originally sans co-ordinates. To fit a geographically correct map the bordure would require increasing in height by 45mm or 1 ¾ inches to 470mm x 425mm. However it must be stated that the map as drawn could be twisted back and it would just fit the bordure, much the same as now with Berwick hardly on the map and the Isle of Wight about to drop off the southern edge. Perhaps this is not a great presentation for the map. The map has an accuracy which tends to make the misplacement of Lands End deliberate, moved north to allow it to fit the copper plate. Has the map been deliberately twisted to the east? 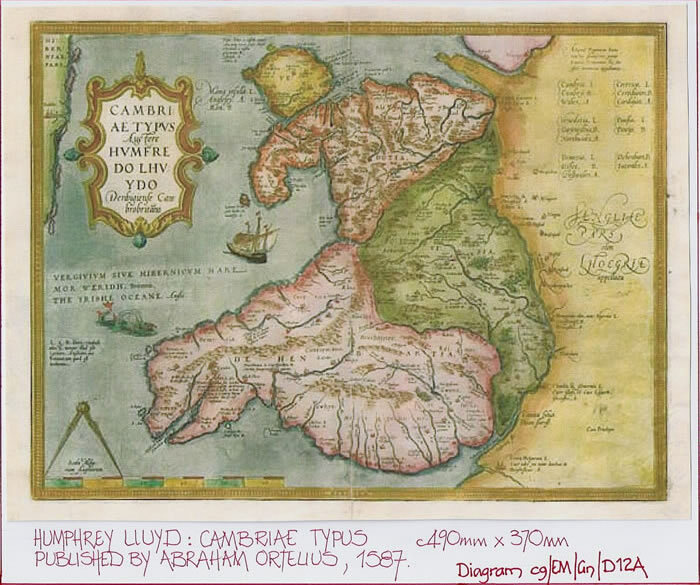 Humphrey Lluyd produced a map of Wales, first published by Abraham Ortelius in 1587 and later by Jansson (1647-1741). This map in either publication, as diagrams cg/EM/Gn/D12 and cg/EM/Gn/D12B illustrate are oriented correctly to NSEW, and thus Humphrey Lluyd was in no doubt where geographical north was situated apropos the form of England and Wales. Thus the question is; did Humphrey Lluyd draw his map of England and Wales set 10 degrees to the east knowing that north was wrongly placed, to fit a pre-ordained copper plate size, or did the engraver twist the map form to fit to the copper plate he was using? It is evident from other maps of England and Wales, as will be shown from the following examples, that the “Geographical Twist” exists. It is also evident that map-makers copied each other’s work, amplified it, adjusted it etc., but, would this account for the eastwards twist? Surely even if one of them knew it was wrong it would be corrected, adjusted, but it carries on and on. But then copper plate and paper was expensive and the less used the better! For example, dating from 1558/59 the Museum of London holds two copper plates, c370 x 495mm, 3mm thick, each being a section of what is known as the “Copperplate map of London”. There were 12 sections in total with only a third extant held in Dresden. This size of copper plate equates to the general dimensions for English Printed maps of the period as listed in the appendix. Their general size is 380 x 510 mm. But these copper plates have both been reused by artists painting on the reverse as if to illustrate for us the fact of their cost and scarcity. Thus it is possible to opine that the copper dictated the map. We have therefore arrived at the dawn of proper English Maps, mathematically constructed, scaled and as geographically correct as the surveyors art at the time allowed. But these maps have some varied peculiarities which require evaluation and explanation. Firstly though, a general list of the maps and their formats. The shape of Britannia in the ancient texts such as ‘De Bello Gallico’ by Julius Caesar is a triangle. Based upon the work of Marinus the Tyrian, Claudius Ptolemy produced a map of Britannia from a table of latitudes and longitudes. The form of the island is quite acceptable, excluding the turned Scotland, and Hibernia is included. The text of his “Geographia” allowed any draftsperson to use the co-ordinates given to construct a map of the whole or partial oikoumene. The preceding sections should have been separated by a description of a Roman map of Britannia, probably indicating the island to be 800 x 300 miles as described by Pliny the Elder quoting the work of Marcus Vipsanius Agrippa. 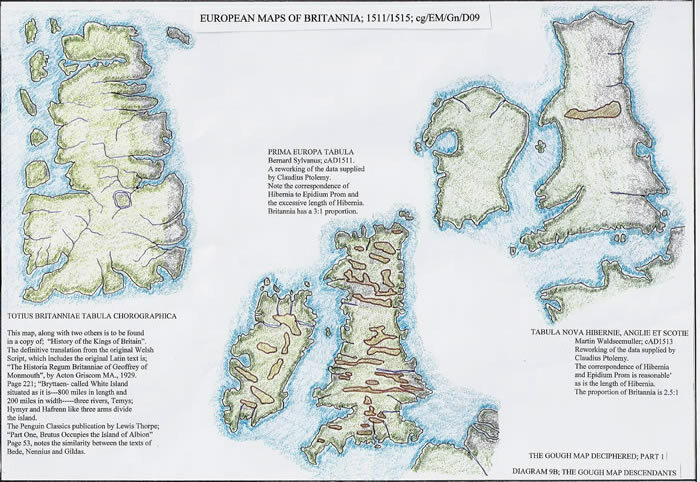 What we do have though from a landscape analysis of Britannia is the resultant of Roman Surveying which enables us to ascertain distance measure and geographical orientation of any map of Britannia drawn as a geographical entity. This information has been used in several papers on this website to align maps to the cardinal points when there is no bordure or north point to orient the map. It is a tool which could be used simply by anybody to determine the scale and orientation of a map. In around the 4th century a new stage in mapping occurred; the Roman world introduced the road map. The Tabula Peutingeriana is a map of the oikoumene, the most famous road map from history and has there-on the major roads of the Roman world with vignettes to illustrate each place and inter-distances written in the measurements of the locality. It is a visual representation of Roman Itinerary lists for travellers, such as the Itinerarium Antonini which lists thousands of places and inter-distances between stopping points or points of note such as bridges etc. This is a map without scale but it has the form of a geographical diagram, although some roads are shown actually pointing in the opposite direction to the geographical truth. It is however a tour de force, a magnificent achievement. The text reference Tp1 on this website describes this road map. In the 13th century, Matthew Paris, a monk at St Albans drew many maps including one for Britannia, England/Wales and Scotland. Although diagrammatic it corresponds to the geography of the British Isles, although unfortunately it places part of the east coast, the Thames Estuary etc., along the south coast, and, Wales extends to the Solway Firth with Hadrian’s Wall. The foregoing text has other pertinent comments. The foregoing text has fully described the Gough map and here-in is the photographic copy and the diagram which illustrates the graticule that can be imposed upon the map using the 11:20 ratio of Claudius Ptolemy. The latitudinal scale is 75 Roman Miles per degree. The map is thought to be based upon a Roman original. Text Gm1 on the cartography page of this website is a full explanation. 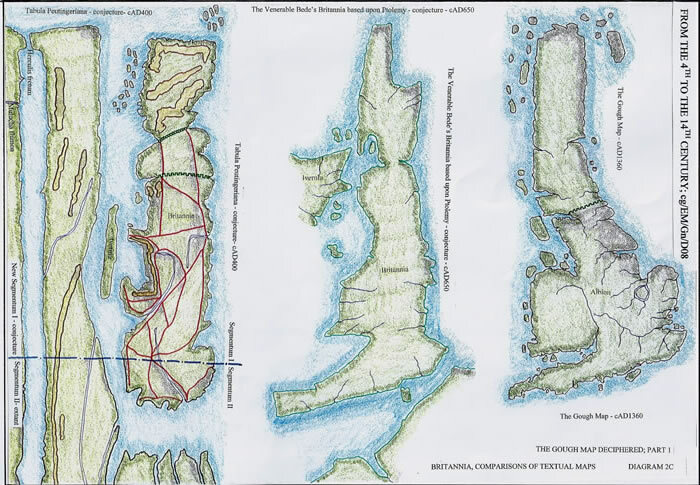 A basic comparison between maps from the 4th, 7th and 14th centuries, all of which are no doubt based upon Roman originals, or relied upon Roman surveying for their basic information. In 79AD Pliny wrote that Agrippa stated Britannia, the island, was 800 x 300 miles. In the 6th century, Gildas Sapiens, a monk, stated the same facts in his treatise, which was then followed by the Venerable Bede in the 7th century and Nennius stating the same facts. This is the transference of data from Rome to England and it persisting for over 600 years. Cartographers in Europe were actually far ahead of their British counterparts and were including Britannia as part of their mapping. Those maps illustrate several traits in cartography which were to be followed by others and include Hibernia with its many variations of mapping form. These actually continued for years with copying from one to another. The Totius Britanniae map is remarkably like the map of Matthew Paris, and may well be a reworking. 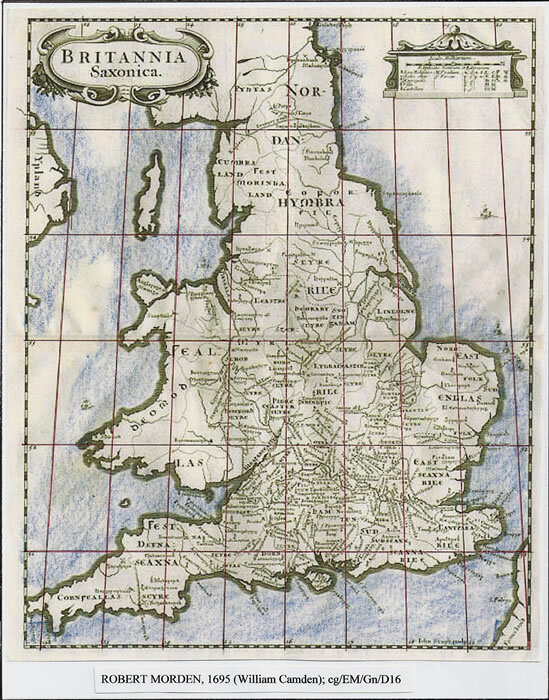 Drawn between 1534 and 1546, this map is the only extant map of Britannia from the period and exhibits a good geographical knowledge of the island. 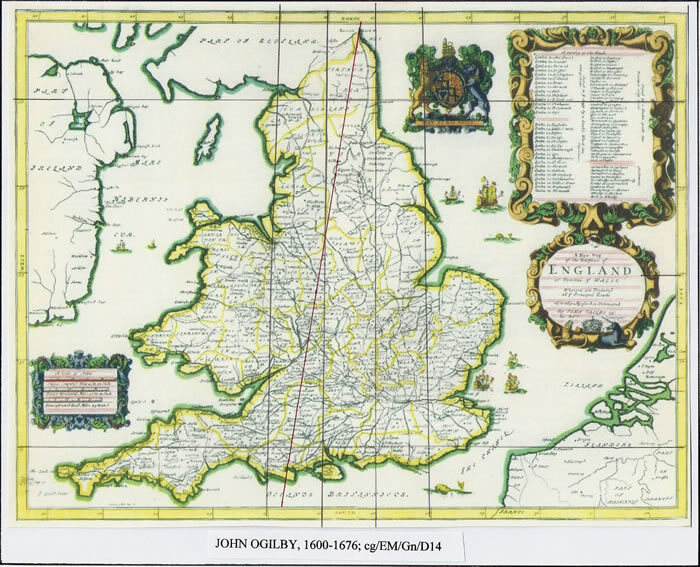 It is quite easy to see its antecedents in areas of the map; Wales from the Gough Map; Norfolk from Ptolemy and Scotland from an adjusted Ptolemaic map. The scale is 500 stadia per degree of latitude as per the Ptolemaic world, and although it has a tapering graticule the central portion is actually 11:20 ratio or 275:500 stadia (furlongs) as per Ptolemy. There is a separate text analysing the complete map which follows here-in. Drawn in Rome, it is an improvement upon the preceding map with regards to the form of Scotland. It indicates the same latitudinal measurement of 500 stadia and is to all intents and purposes the same graticule, except that the longitudes are numbered differently, that is 2 degrees to the east. 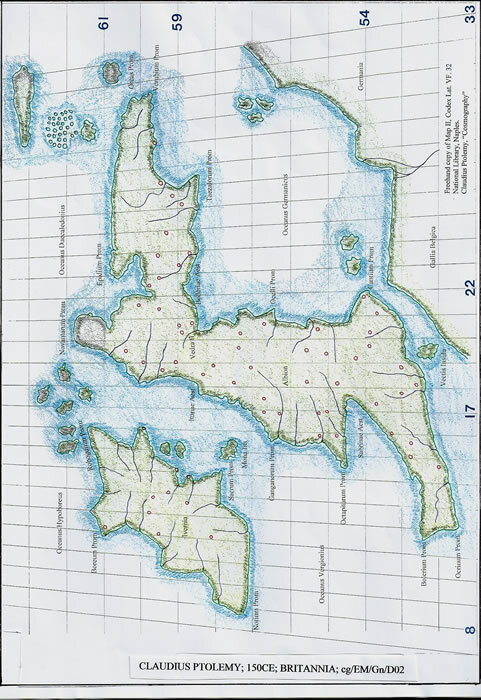 There is a complete text reference Cs1 on the cartographical page of this website. These maps are further discussed in paper cgEm/0, section cgEM4. Angliae Requi Florentissimi Nova Descriptio Auctore Humfredo Lhuyd, published 1579. 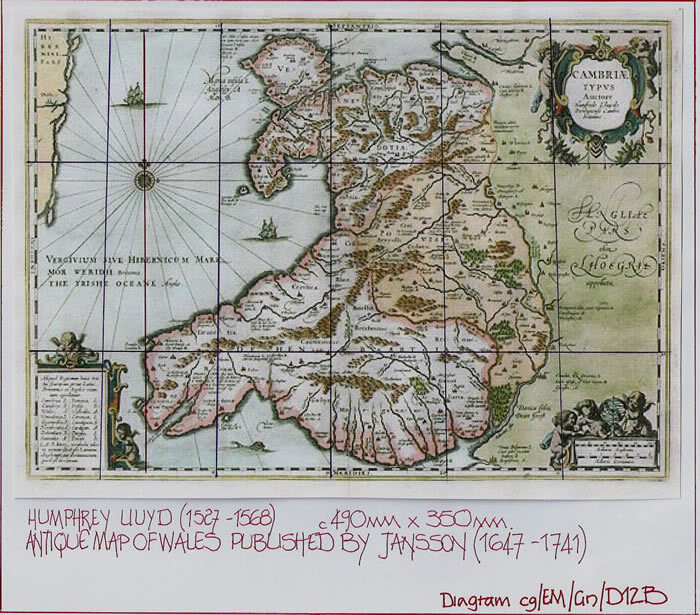 This map was not drawn in England but at Denbigh in Wales. However it was not published in Britannia, but sent to the continent, to Abraham Ortelius, to be published in his ‘Theatrum Orbis Terrarum’. The Latin version is dated 1603 and the English Version 1606. The map has a hidden geographical graticule of 11:7, whilst appearing to be quite accurate in fact suffers the same fate as a map by Christopher Saxton which was also copied on the continent by Joan Blaeu, but he extended it longitudinally by 115%, whilst maintaining the latitudinal scale. However, the map has been set down on the page at a peculiar bearing to the bordure. 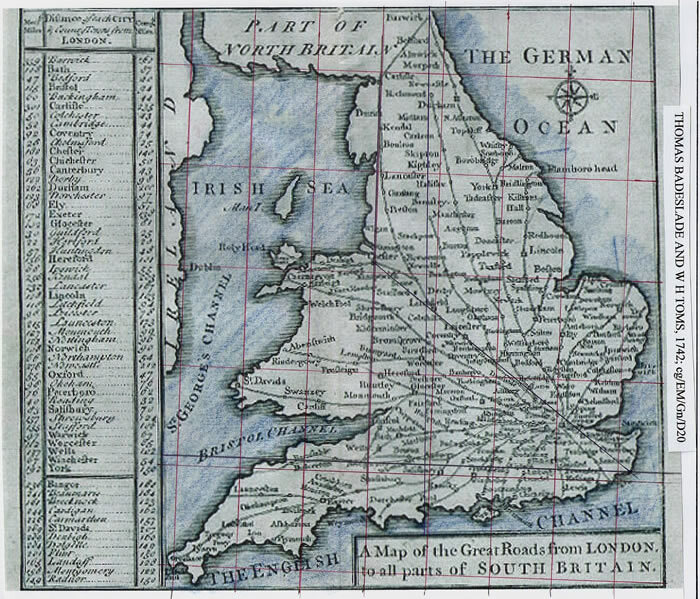 Lawrence Nowell wished to complete an atlas of Anglo-Saxon Britain, but the most he achieved in terms of an overall map was an accurate pocket sized map of Britain used by Sir William Cecil. He also carried out a cartographic survey of the east-coast of Ireland. John Speed, 1552-1629 was a member of the Society of Antiquaries, a historian and engraver cartographer. He was possibly the most well known map-maker of the Stuart period of English history. “The Invasions of England and Ireland with all their civill wars since the conquest”, is a map by John Speed engraved by Cornelius Dancherts. 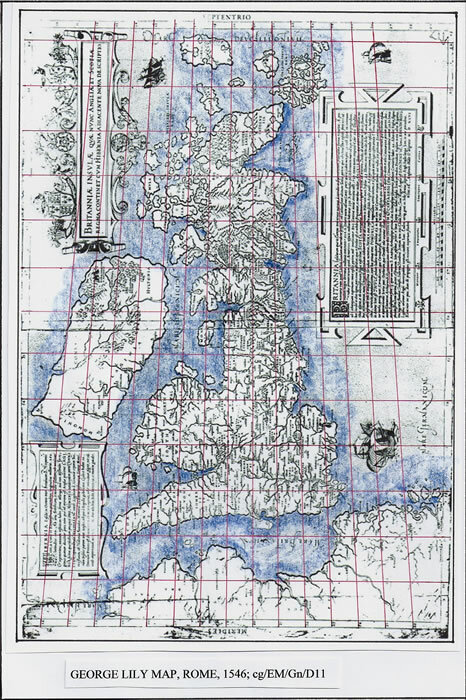 A copy of his ‘Invasions map’ can be shown to have a rectangular graticule based upon a geographical graticule. The map has a basic 27:16 grid with the north point being reasonably correct. This is one of three maps to be discussed in a following paper Mt1. 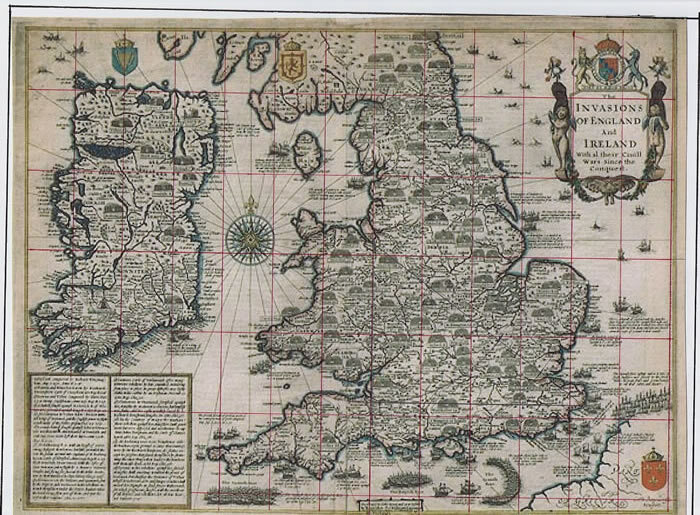 John Norden c1547-1625, was an English cartographer, who planned but did not complete a series of county maps. He produced excellent maps of London, Westminster and other counties. He was surveyor of the Crown Woods in 1600 and after the surveyor to the Duchy of Cornwall. In 1612 he became surveyor of the Royal castles in southern England. Unfortunately a great many of his cartographical works are now lost. Maps taken from Ogilby’s ‘Britannia’ of 1675. A map with a bordure scale which if projected across the face of the map indicates a distinct problem apropos a geographical alignment. There is a twist in the graticule as indicated on the Humphrey Lluyd map. Here we see a well drawn and surveyed map by Herman Moll. Other than the longitudinal base being probably St Pauls Cathedral, as opposed to the later agreed Greenwich meridian (which could not really be noticed on a map of this scale), it is quite accurate. The Latitudes are correct and of our examples this is probably the first ’geographical’ map. There is a map scale of 60 miles for the latitudes and thus it is possible that Herman Moll is using a Mile of 115% scale that is 60 to 69 statute miles, and thus may also be the Miliaria of previous maps. A print of Britannia Saxona by Robert Morden, engraved by John Sturt and Published in ‘Britannia’ written by William Camden. Britannia Saxona has a bordure scale, but it is not a geographical alignment as cg/EM/Gn/D17 illustrates. The latitude scale is Miliaria, 60-69, but the longitude is 37:24 ratio and is a rectangular graticule, not the imposed tapering grid of the map. “A new sett of maps of both Antient and present geography.” Engraved by Sutton Nicholls. This map has a bordure scale, tapering as a geographical graticule should. There are two scale bars appended,” a vulgar comparison” and a scale” according to Nowell’s computation”. 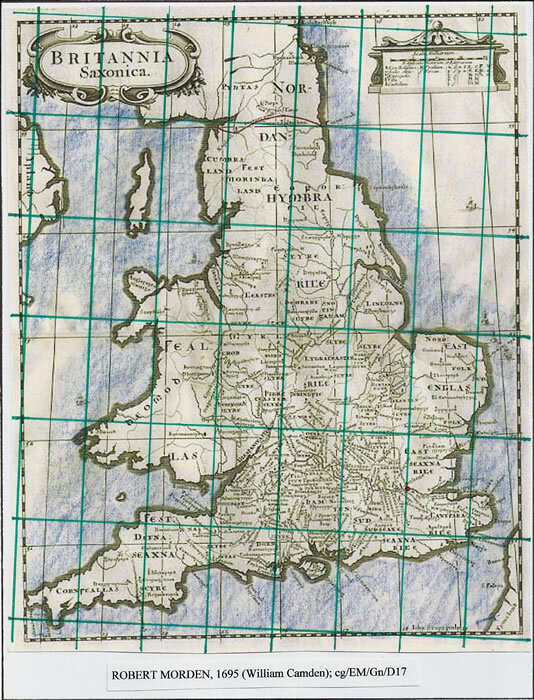 It is seriously distorted, and portrays an expansion longitudinally similar to continental maps of Britannia. “A chart showing the sea coast of England and Wales, with fortifications etc”. 1742. These maps are from Chorographia Britannia published in Atlas form, 1742, engraved by William Henry Toms for Thomas Badeslade. 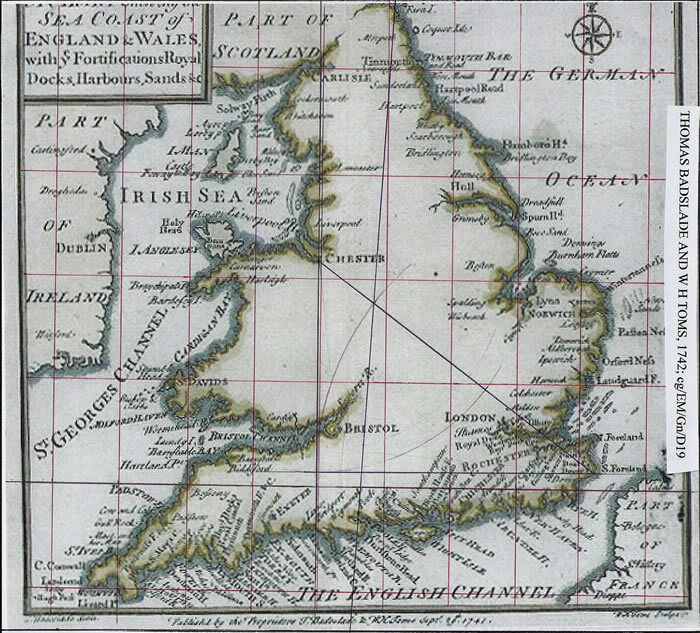 The first map, the Sea-Coast, indicates that a rectangular graticule can be aligned to the geography of the map. However, Poole Harbour does not quite align to Berwick for a true north. The latitudinal scale is reasonable but again the longitudinal scale is expanded by at least 115%. The two road maps are far more accurate than the Sea-Coast map and although the latitudinal scale is the same the longitudes are very different. “A new map of England and Wales divided into counties”, engraved (by the King’s authority) for the “Geographical Dictionary”. This map is similar to many that precede it, in that the bordure scale is correct latitudinally but has the expansion longitudinally of the others. The accuracy is becoming so very apparent in the maps, including Hibernia, and the drift of true north is hardly noticeable. 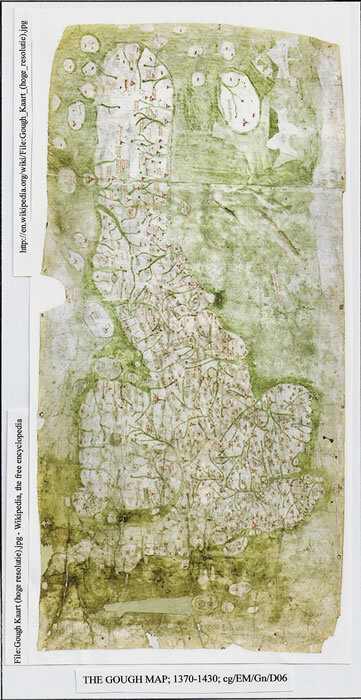 Early English maps being studied which have scales appended appear to be based on a measurement of 60 miliaria per latitudinal degree. The miliaria is a rather nebulous measure being variously thought of as 5000 feet, Roman or English, to 1.15 or 1.2 statute miles. There is however a simple explanation, a possibility which cuts through the miasma of variation and introduces but one basic measure. If the miliaria is 1.2 statute miles, thought of as 10 stadia or furlongs, there is the simple transference of just figures, a number, and therefore units of measure to explain the miliaria. The Statute Mile is; 8 furlongs or stadia of 660 feet, an acre length, or 1760 yards, 5280 feet and 63360 inches. The map scale of 60 miliaria per degree of latitude, if they were actually Statute miles and not miliaria would require an expansion of 115% to numerically equal the actual 69 miles of a degree. But if the length of a miliaria is 6336 feet, that is 1.2 statute miles, a reduction from 72 miles to 69 miles would be required. The degree of Latitude could be measured and measured accurately and thus this is highly unlikely. There was another known length for the degree of latitude, the Roman measurement of 75mpm, which is possibly used. Thus if the map scales in miliaria are based upon the degree of latitude being 500 stadia or furlongs, then there is a simple comparison to be made. The 500 stadia degree is in fact 62.5 Roman miles of 8 stadia and thus it would be the Roman World latitude of 75 Roman Miles with each being 600 stadia in length. Thus the expansion is from 500 to 600 or 120%. The correct geographical latitudinal degree is 604 stadia, 111.136Km or 69.06 statute miles. Volume 76, No4, October 1930, “The Old English Mile”, by Sir Charles Close; pp338-342. Volume 77, No4, April 1931, “Further notes on the Old English Mile” by J B P Karslake; pp358-360. Volume 91, 1938, “The Old English Mile and the Gallic League” by G Grundy. 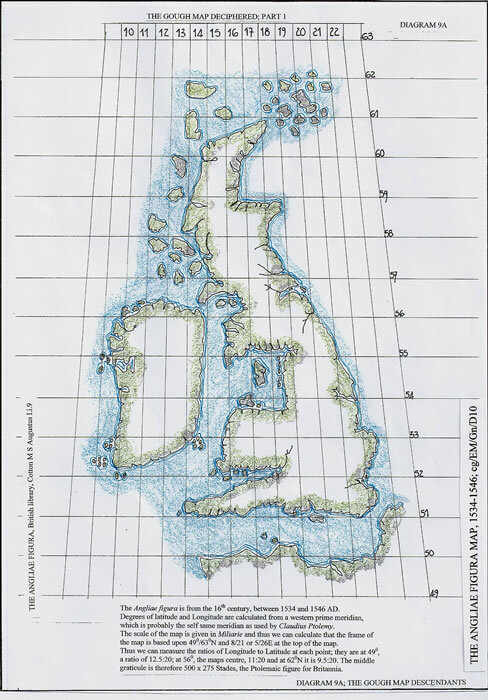 Volume 141, No2, July 1975, “A Cartographic evaluation of the Old English Mile” by I M Evans. The Stenton Lecture, 1971, Reading by P Grierson, “English Linear measures”. 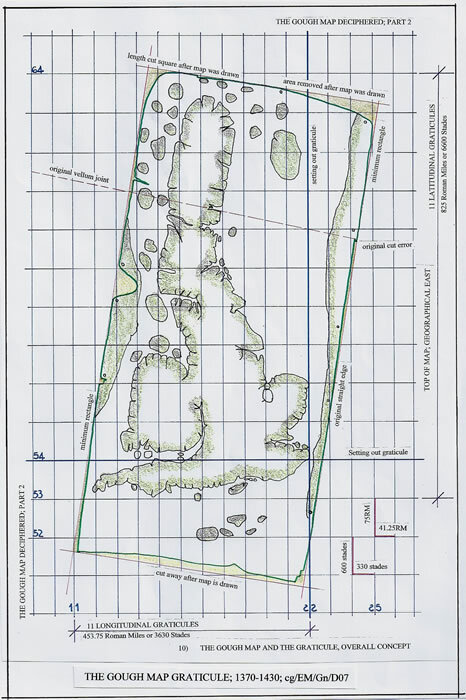 Seebohn F, 1914; “Customary Acres and their historical importance”, Longmans Green, London. Connor R D, 1987, “The Weights and Measures of England”, Science Museum, London. The English maps discussed all exhibit the geographical twist, but to varying degrees. They are all basically the same size. Is that size dictated by the copper plate and printing bed, and is this therefore the reason that these maps are twisted to the east. It is inconceivable that every cartographer would have twisted the map he was constructing when geographical north was well known. Delano-Smith, Catherine and Kain, Roger J.P. “English Maps, A History”. (London, The British Library, 1999) pp. 7-111. Harley, J.B. and David Woodward (eds), “The History of Cartography. Vol. 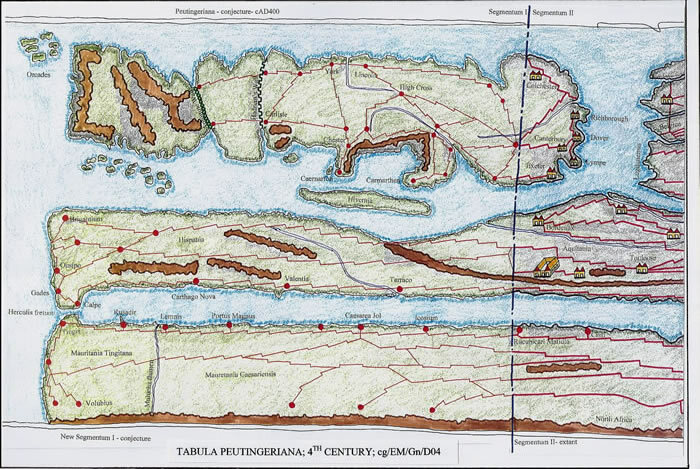 1, Cartography in Prehistoric, Ancient, and Medieval Europe and the Mediterranean”. (Chicago and London, Chicago University Press, 1987) pp. 464-501. Tyacke, Sarah (ed). “English Map-making, 1500-1650, Historical Essays”. (London, The British Library, 1983). Ogilby, John. “Britannia; An Illustration of the Kingdom of England and the Dominion of Wales”, (London, 1675). There is a bibliography of Early Printed maps of the British Isles, 1477-1650, by Rodney W Shirley, Holland Press; Cartographia 5, 1980, which can be used to ascertain the size of maps and thus the limitations imposed by the early printing press beds for the copper plate sizes. 267 Anon 1605 London ? It will be evident from the foregoing that a basic size c400 x 500mm is prevalent and thus must be considered a norm for the copper plates used.